The Delaware County Planning Department hosted the first of a three-part series titled Placemaking: the act of creating vibrant spaces for communities on March 21 at the Springfield Township Municipal Building. Placemaking is a technique which focuses on designing creative spaces or events catered to the community’s character. Successful placemaking has been proven to increase economic development, engage the community, and increase the quality of life. The presentation included discussions among elected officials, municipal staff, professional planners, economic development officials, and non-profit leaders looking to make a lasting impact in their community. Guest speakers included Jeffrey Barg, Associate Director of Planning and External Policy Relations for the Pennsylvania Horticultural Society, Michael Cheney, Managing Director of Urban Design for Groundswell Design, Katrina Johnston-Zimmerman Project Manager at The Lindy Institute for Urban Innovation and Marisa Denker, Founder of Connect The Dots. 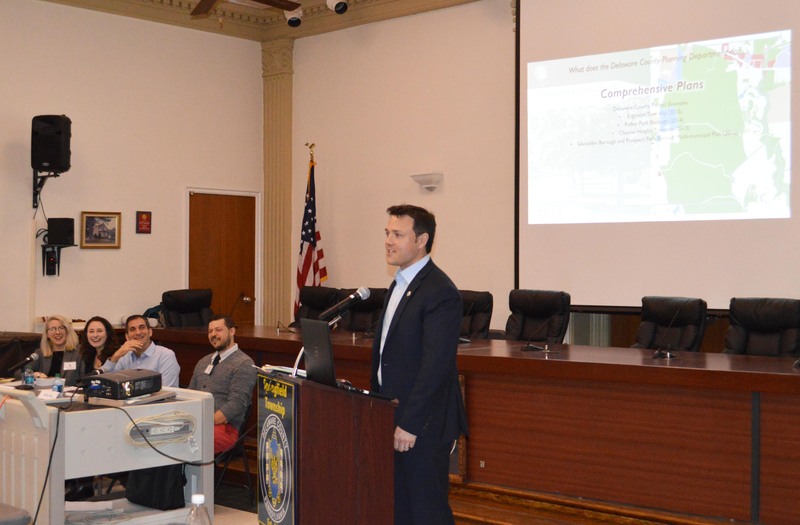 he Delaware County Planning Department hosted its first Energizing Your Downtown (EYD) event, as part of the Planning Beyond Paper initiative in October 2018. While EYD was originally created as a single event, the need and desire for additional training and information on best practices for the County’s downtowns became apparent. With the encouragement from Delaware County Council, the Planning Department transformed Energizing Your Downtown into an ongoing initiative, aimed to educate municipal officials and community leaders on ways to enhance local downtowns. Placemaking Part One: Identifying Your Community’s Strengths was the first session under the new Energizing Your Downtown initiative. The goal of the session was to facilitate a discussion on events and cultural planning with community identity in mind. Local experts shared their experiences in creating Placemaking projects from the ground up and expressed the impact such projects have made on local communities. Placemaking focuses on strengthening the connection between residents and the places they share. When people are connected to the places they live, they invest in that space: financially, socially, and emotionally. Placemaking emphasizes the importance of community collaboration, creativity, and vision. Successful places draw both visitors and prospective residents to the community and keep longtime community members engaged and attached to the area.